Increases the speed of all arrows and bolts, and makes them fly further before dropping towards the ground. This particular speed makes archery more realistic and satisfying while respecting gameplay mechanics. Now also disables NPC's ability to dodge projectiles out of nowhere like Neo. The mod and all patches are now internally flagged as ESLs, meaning that they don't take up a load order slot once the game is running. No need for a merged patch! Disabled auto-aim in the global game settings. Slightly increased bolt speed and gravity. Bolts are now exactly 50% faster than arrows, like they were originally. Corrected aim settings in the .ini. Released patch for Hunterborn with Scrimshaw Expanded. 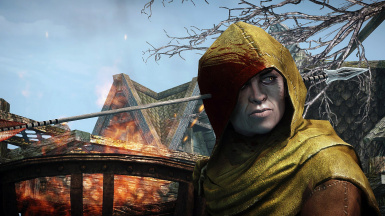 This mod increases the speed of all arrow and bolt projectiles by 42%. They also fly further before dropping towards the ground. Allows all projectiles to hit targets that are far away, makes arrows fly through the center of your crosshair, disables auto-aim, and stops NPCs from dodging like Neo! The mod and all patches are flagged internally as ESL, so they don't take up any load order slots once the game is running. No need for a merged patch! Automatically tweaks Nightingale Arrows if you have Awesome Artifacts installed. Comes with an .ini file that automatically sets the right aim settings for you. If it doesn't work from your data folder, copy its contents into your skyrim.ini. These settings have been tested and fine-tuned over years to achieve what I feel is a pretty perfect compromise between realism and good gameplay. Projectile Speed Tweak is available for the classic version of Skyrim here, and for Xbox One on Bethesda.net.